The mineral beryl is made of beryllium aluminum cyclosilicate, Be3Al2(Si O3)6, The beryl family is made up of emerald, aquamarine, morganite, golden beryl, and the ultra rare red beryl (bixbite). Each of these beryl varieties are distinguished by their color, transparency and clarity. 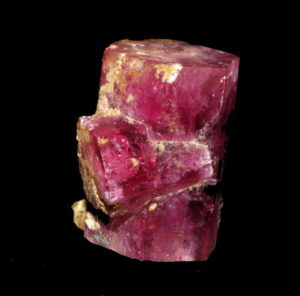 Unlike other beryls, red beryl is found in white volcanic rhyolite. Its Mohs hardness is 7.5-8 which makes it the perfect candidate for jewelry. Red beryl, has also been marketed under the name red emerald. This incredibly rare mineral was discovered in a commercial mine named Maynard’s Claim in the Wah Wah Mountains of Utah in 1904 by mineralogist Maynard Bixby. Mineralogist Alfred Eppler named the mineral “bixbite” in honor of Bixby. In the same location, Bixby also discovered the black mineral bixybite in 1897. In order to avoid confusion between bixybite and bixbite, bixbite was renamed to “red beryl”. Even though there was never any agreement to an official name, the World Jewelry Federation has discredited the name “bixbite” and only allows the name of “red beryl” to be used in mining and marketing. Red beryl is very rare because in order to form it requires a unique environment. The element beryllium needs be present in large enough amounts to form minerals and dissolved manganese needs be present at the same time and location. Geochemical conditions must be present for beryllium, manganese, aluminum, silicon, and oxygen to crystallize into red beryl. Manganese is what gives red beryl its red color which can vary from a raspberry pink to a deeply saturated red. It is so rare that for every 150,000 diamonds that are mined, one red beryl crystal is found.